This gelato has been months in the making, literally. I first thought of it during Mardi Gras season, then it came to me again several times during the spring, then again when the temperatures cranked up in June. I couldn’t get it out of my mind, and unbidden thoughts of sweet, rummy bananas swirled into a French vanilla gelato would come when I passed the bananas display in the grocery store. It was time to do something about this little obsession of mine, and oh it was worth it. 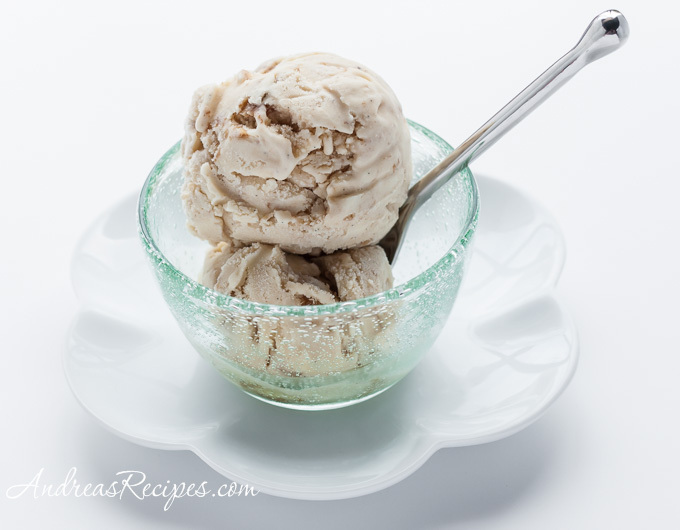 When making gelato at home with a standard ice cream freezer, it helps to prefreeze the gelato base about 30 minutes before churning. You don’t want it frozen, just really really cold so the churning time is reduced and less air gets whipped in, which will help render a rich, creamy gelato texture. Adapted from Making Artisan Gelato, by Torrance Kopfer and Remembering Bill Neal, by Moreton Neal. 1. GELATO BASE: Put the split vanilla bean and its seeds in the saucepan, then add the milk and 1/2 cup (100 g) of the sugar. Cook over medium heat, stirring occasionally, until the thermometer registers 170° F/77° C. Remove from heat, cover, and allow to steep for 30 minutes. 2. Remove the vanilla bean pod and return the pot to the burner. Warm over medium heat, stirring occasionally to prevent scorching, until the thermometer registers 170° F/77° C.
3. In the other 3-quart bowl, whisk the egg yolks with the remaining 1/4 cup (50 g) sugar until the mixture is foamy and slightly thickened. 5. Make an ice bath in the large bowl and set the bowl with the heavy cream mixture on top. Place a fine-mesh strainer on the rim of the bowl and carefully pour the custard through the strainer. Stir the custard about every 5 minutes until the mixture is cooled, about 30 minutes. Remove the bowl from the ice bath, dry the bottom, and cover with plastic wrap. Chill in the refrigerator for at least 8 hours or overnight. 6. 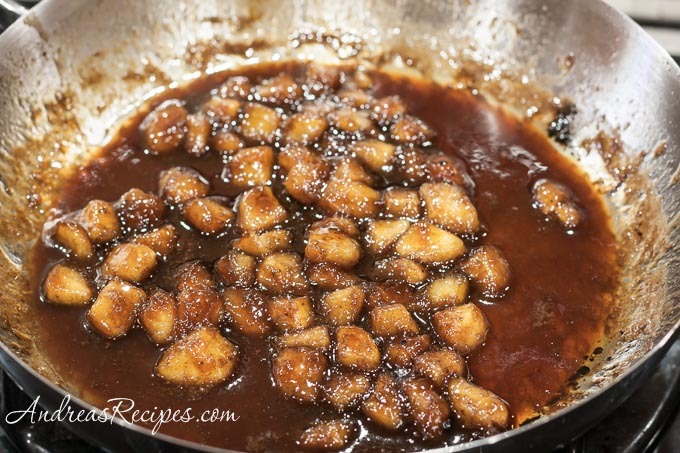 BANANAS FOSTER: Melt the butter with the brown sugar and cinnamon in a sauté pan over medium heat. Add the banana pieces and sauté until the banana is thoroughly heated, about 3 minutes. Pour in the liqueur and the dark rum and carefully light with a match. Baste the banana with the flaming liquid until the flame burns out and cook for about 2 more minutes to reduce the liquid. Allow to cool thoroughly. 7. CHURN: About 30 minutes before churning, set the bowl in the freezer to get the mixture as cold as possible without starting to freeze. Pour the mixture into your ice cream maker and follow the manufacturer’s directions for processing. Add the bananas foster during the final 2 minutes of churning. 8. Transfer the churned gelato to the plastic container. Press a layer of plastic wrap against the gelato and seal the lid on top. Freeze until fully hardened. This looks delicious. Nice recipe and great photo too! What a fantastic flavor concept. I could totally go for a scoop right now. Someday when I get past my fear of flambeeing (is that a word?) I’d love to try this. In the meantime I’ll ogle your gorgeous pics. Oh wow, this looks amazing! so rich with flavor beyond just banana.